Summon your Komajiro minion. He might as well tag along on your adventures as he searches for his older brother. 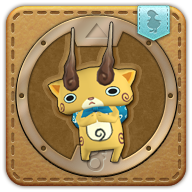 Komajiro is Komasan's younger twin. He looks for his runaway brother, but he can't find him anywhere.